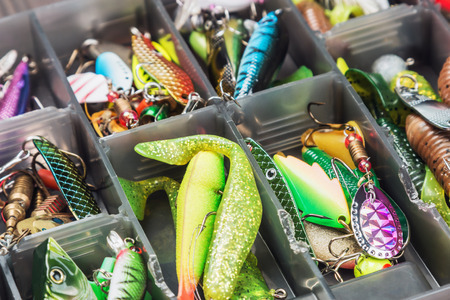 Your tackle box is probably filled with a variety of colors, shapes and sizes that you’ve accumulated over the years. And we all know: great bait makes for great fishing! We supply everything you need aboard the Triple Trouble, however it’s good for any angler to know their bait well. Here are a few things to consider when sifting through your collection and determining the right bait for your next big catch! Before you choose your bait, you have to choose your fish! By identifying the fish you are hoping to catch, you will be able to cater your lure or live bait to match its prey. The size of your bait should complement the size of your target: smaller bait for smaller fish and upsize for the larger species. Most fish are used to eating things that are natural shades, however, that doesn’t mean your brightly colored lures should be put to rest. If your fishing trip occurs on a cloudy more overcast day, stick to the neutrals. If you go out on the water with the sun shining and not one cloud in the sky, then brighter colors will do the trick. Take into account the temperature of the water before setting up your line! Slow-moving bait performs better in colder waters, while faster baits tend to win out in the warmth. Lucky for us anglers, fishing is year-round, so you’ll be able to try out a plethora of bait out on the water and find what works for you. Now it’s time to get out on the Gulf waters off the coast of Alabama aboard the Triple Trouble and reel in some trophy giants. Bring your own fishing rod and tackle if you choose, but our charter is fully equipped with the gear and bait you need to fight hard against the saltwater fish. Call us at 256-431-5767 or email Captain Chad today to book your trip!